FANBOY PLANET.com . : mc-memoryalmostfull :. 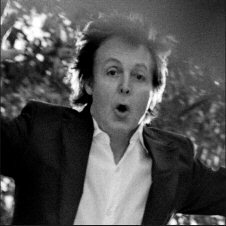 With today's disposable pop icons, the anticipation and trepidation of a new Paul McCartney album might not make sense to a lot of Fanboy Planet readers. Then again, you at least know what it's like to follow a beloved comic book character or wrestler, and wonder if this time the story is going to be worth your devotion. So it goes with McCartney. Obviously, if you're a Beatles fan, he has to hold your interest. For me, though, it started with 1982's Tug of War, a record (!) I bought and listened to a few times and didn't regret. Then my father died the following Spring, and suddenly some of the songs on that album held new meaning for me, played over and over as I tried to get through the tragedy. When I got into my car after my dad's funeral, the song on the radio was Paul McCartney and Wings' "Live and Let Die." No frog chorus here; it just cemented my being a life-long McCartney fan. Yet sometimes his catalog made it hit and miss. Every now and then you'd find a gem, but every Tug of War seemed to have two Pipes of Peace. Give My Regards To Broad Street was pretty good, but it was also pretty much a "Best of" album - largely better than the actual "Best of" album that he put out later. I dutifully bought them all, listening once and putting them away, wishing for something to hold my attention and be as consistently listenable as I knew Paul could be. Then came Memory Almost Full. The album has received media focus because it came from Starbucks' new label. What may be harder to believe for some, though, is that it's also his best album in twenty-five years. And believe me, I've got a lot to compare it to. From the first track, I had new hope. "Dance Tonight" has a simple rhythm, really a stomp, countered by a playful mandolin line. In some ways, it sounds like something the Traveling Wilburys would have done, but then McCartney throws in one of his unique glissandos. He keeps the lightness of the music going in "Ever Present Past," though the lyrics grow a little darker. It never falters. I was sure that somewhere around the bend I'd get a song like "Temporary Secretary" that would have me cringing. The highlight comes with "Only Mama Knows," one of those story songs that Paul did so well with the Beatles, but this time as if he'd written it with Wings. With John Lennon, Paul wrote melancholy tales; here, he's become a little angry and definitely confrontational. The album calls to mind a lot of his career. A phrase here could have come right from his early days in Liverpool, before turning into a lick that Denny Lane could have done. Even as he plays with a variety of genres, you can also hear the background vocals in the style of his late wife Linda - that trademark "loo loo loo loo." Yet the album isn't looking back to the far past. There might be a paean to his daughter in "See Your Sunshine," at least in some lines, and the hard-rocking "Nod Your Head" could be an angry screed to his ex-wife Heather Mills. But mostly this is an artist at 64 telling us that not only is he still here, he's still vital. I got the message loud and clear, Paul. Thanks for finally sending it.